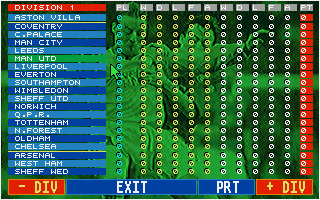 Championship Manager was the very first game in the popular Championship Manager series of association football management simulation games. The game was originally released on the Amiga and Atari ST in September, 1992 and then ported to the PC DOS platform soon after. 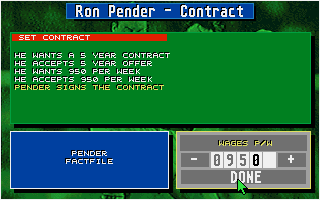 The game was written by Paul and Oliver Collyer (the co-founders of Sports Interactive) in their bedroom. 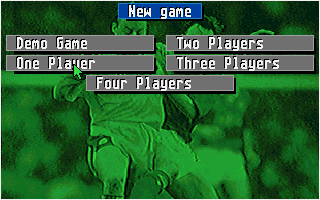 The game featured four playable English divisions (First through to Fourth; the newly formed FA Premier League did not appear until CM 93/94). Perhaps most notably, each division contained only 20 teams, whereas in real life they contained 22 or 24 teams at that time. Also included were all of the major domestic cups of the time (including the Anglo-Italian Cup) and the 3 major European trophies (including the now defunct Cup Winners' Cup). Any teams outside of the four playable divisions and all foreign teams had no player names at all. Instead, players were simply called "No.3" or "No.10" depending on which position they played. One of the most innovative things about the game was the introduction of "average ratings" for players - after each match the performance of every player was graded from 0-10 and as the season went on the player's average rating would allow the manager to easily see how each player was performing. Did you play the very first version of CM? Any memories to share with us? I would have been six years old when this was released! So I think it's safe to say that I didn't play this. It's amazing though to think that it has been 22 years since it was released in 1992! I've been doing a lot of reading up on this version of the game and had no idea that the players names were actually random which worked against it at the time. 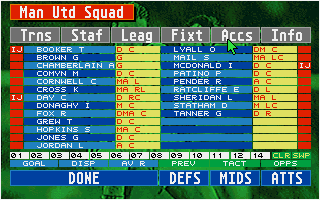 That's the original CM1 with fictional players I think. I should add a link in CM1 thread for people to download all the CM1s. Yes, it is, Cam. That's why I've posted it in the CM forum . Soz, didn't read that thread lol. Have now Captain. Yep, im an old git! Had the original (copied of course ) on my amiga a600, bought the next version, 'obtained' the end of season mark collis ferrah orosco version and both the cm italias. Cantona and van basten were beasts in cm italia! 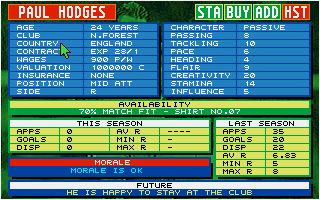 I remember watching a friend of mine playing a manager game on Amiga when we were kids, ages ago. I thought it was CM, but it had actual players/names, so if the original CM had random names it must have been another game. 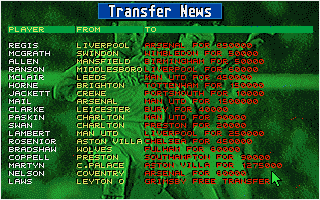 -> just googled it - I'm thinking about CM '93. It looks (and probably plays) the same as the '92 edition, although actual names has been included. Recommended games in the series? Does anybody like or vouch for any of the BGS Champ Man games? CM5 was enough to kill the series stone dead for me, did they actually manage to get a playable PC game? Mark any chance you can move this thread in amongst the championship manager threads? It feels a bit lost in current location. Hmm, which section is it supposed to go into? Tried on my pc and mobile. Slower than my grandad and he has been dead 3 years. Hopefully someone can speed it up as would be amazing to play on train.
.:: Story :: "In Diego we trust" ::. After the golden era leaded inside the field by Diego Armando Maradona, Napoli faced economical troubles and had to sell its key players. At the end of the 92/93 season Gianfranco Zola to Parma for £7M. After 93/94 season Daniel Fonseca to Roma for £9M and the exchange of Benito Carbone valuated in £4M, and Ciro Ferrara to Juventus for £5M. Marcello Lippi also left to Juventus at the end of the season. Some good players come to the team for the 1994/95 season, like the brazilian André Cruz from Standard Liege, french Alain Boghossian from OM, colombian Freddy Rincón from Palmeiras and the previously mentioned Benito Carbone from Roma. The team has a good balance between experienced players like keeper Giuseppe Taglialatela, defender Roberto Bordin, midfielders Roberto Policano and Freddy Rincón and forwards Renato Buso and Massimo Agostini, and good young prospects like Fabio Cannavaro, Gabriele Grossi, Gaetano De Rosa, Fabio Pecchia and Benito Carbone. For this season president Ellenio Gallo decided to hire Vincenzo Guerini but something changed his mind. The best player in Napoli's history after two years managing Mandiyu and Racing Club from Argentina expressed his wish to manage his loved italian team. And noone at the southern italian city could oppose that wish. hello i would like championship manager 2001-2002, somebody has got it? It's all in the downloads section at the top of the website.